In The Grapes of Wrath, John Steinbeck describes the harrowing journey of the Joad family - migrant workers forced to leave their home during the Great Depression - a story still relevant to those facing the realities of America's current economic crisis. "To the red country, and part of the gray country of Oklahoma the last rains came gently, and they did not cut the scarred earth…" That is how Steinbeck begins The Grapes of Wrath. This year the last rains came in May to western Oklahoma. They lasted long enough to produce the last alfalfa crop but the winter wheat was already lost. Brett Porter, who farms 3,000 hectares, unrolls the last of his hay in front of a thirsty line of prime Angus cattle. With just 18 bales left, and at $200 (£123) a bale on the open market, when he runs out he will have to sell the cows. "I already sold half my mamma cows and I sent my calves to market early," he says. He has been working on the herd's DNA for 12 years. If no rain comes, he will sell the rest for hamburger meat before high summer. With the south-west in the grip of its worst drought for 60 years, old-timers here are beginning to talk about the Dust Bowl years, years Steinbeck chronicled in his Pulitzer Prize-winning book of migration, poverty and social injustice. I decided to retrace the route Steinbeck's fictional family took from Oklahoma City to Bakersfield, just north of Los Angeles. I hired a boaty old Mercury and put my foot down. Today the road is just one straight freeway, Interstate 40, though the old Route 66 of blues legend still weaves along as a forlorn side-road. The BBC's Paul Mason explains how The Grapes of Wrath is relevant today. 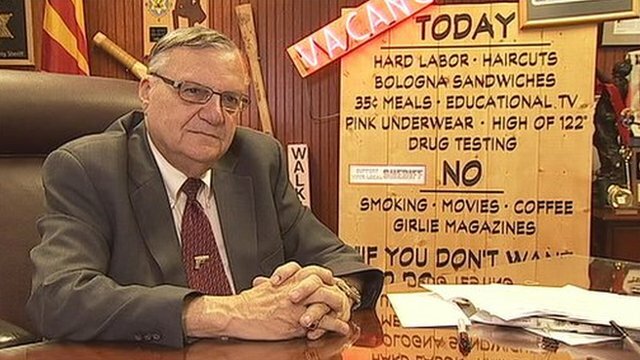 "America's toughest Sheriff" Joe Arpaio is known for his outspoken stance on illegal immigration. After the Texas panhandle, scorched by drought so white that the grass crunches underfoot like in a deep frost, I hit New Mexico. Here the landscape changes to mesas and gulches. I drop down into Albuquerque, into Joy Junction, which in the red dusk looks like a scene from Steinbeck. There are 300 homeless people staying here, all families. Jeremy Reynalds, an expat Brit who runs the place, tells me frankly that the mainstay of the place are people with drug, alcohol and domestic violence issues. But as the years of crisis have dragged on, there is a new phenomenon - the homeless middle-class. I meet some of them on the floor of an old gym, strewn with about 80 mattresses. Sonya and Tim - he was a manager at McDonald's but the branch closed and she worked at Subway but they cut her shifts - lost their home and moved into a small apartment, but when the unemployment money ended they lost that too. "We slept in our car, it was scary," says Sonya. "Then we came here." Larry Antista and his 14-year-old daughter Michelle are bedding down alongside 80 people they do not know. Does her school know she is homeless? "I didn't tell them," Michelle says. "I stay there until six o'clock to do my homework." They lost their apartment when the family split up. Maurice Henderson and RoseAnna Ortice are across the parquet floor with their three kids. Maurice used to manage a car dealership. They lived in a motel. The day his unemployment cheque did not arrive was the day he had to leave the motel and come here. They have been on the mattresses for two weeks. There is wrath aplenty here - though you seldom hear such thoughts expressed on the US media. "They're wasting money on wars," says Larry. Maurice tells me the same thing. A guy crawls over his large family and almost whispers to me, "I'm Native American. My tribe runs a casino so where does the money go? Why don't they use it to help their own people?" Though the Okie camps of the 1930s are emblematic now - as are the dustbowl photographs of Dorothea Lange - it is easy to forget they were not front and centre of the nation's consciousness in the 1930s. Steinbeck, who had lived in California most of his life, had to be alerted to the existence of the camps on his doorstep by Lange's husband, an academic, who wrote one of the first field reports of the migrant problem. Then, as now, the poor had only a walk-on part in the mass media, and their script lines seldom reflected what they actually thought. All along Interstate 40 I have been cursing the motelscape. The inedible sludge of reconstituted egg, "biscuit" and gravy that allows them to advertise "hot breakfast" - the coffee weak enough to read the Wall Street Journal's markets pages through. Reynalds takes me to a line of cheap motels right by the interstate where rooms are $29 (£18) a night. "These places fill up in the first two weeks after the benefit cheques are paid and when they run out, they empty out and people drift over to Joy Junction." Now I see the cheap motels in a new light. This is where America's hidden homeless live. As I leave New Mexico and tank west beneath the mighty Mogollon Rim and into pine forest and then the cactus-strewn desert, one thing becomes clear... Steinbeck cannot have made this journey in one go. The spectacular landscape is absent from the book - the Pueblo nation's shacks and trailers, the emptiness. For the 350,000 real-life migrants - farmers, unemployed workers, office workers - who made the journey during the Dust Bowl years (1931-36) this must have seemed as alien as the Moon. But Steinbeck is not about landscape, biblical though The Grapes of Wrath reads. It is about the conflict at the end of the journey and today you don't have to get to the end of the journey to find conflict. In Phoenix, Arizona, I get to tour the Tent City jail. Prisoners wear stripes, pink socks, pink underwear and are forced to live, day and night, in Korean War-era tents. On the day I arrive the mercury's thermostat tells me it is 114F (45.5C). They must remove their pink towels from their heads, even in harsh sunlight. And they must pay "premium rates" my guide tells me, for their landline calls, "to help pay for the cost of incarceration". One in five of the male prisoners is a detained illegal migrant. After their sentence, they will go into the deportation process. The jail - like the border fence and Arizona's famous new law SB1070 - is designed to deter migration. But neither deter it. There are, say migrant activists, an estimated 1.5m illegal migrants in Arizona. Fernando Lopez, aged 20, was caught driving without a licence and has no documents that prove his right to stay here. He says he was shunted for a month around the Arizona detention system before being released on bail. He is fighting deportation now. "People still come, because of the conditions across the border," he tells me. The North American Free Trade Agreement, he believes, has bankrupted small business in Latin America, and the same rural poverty you find the whole world over simply drives people to move north. Leticia Ramirez, an activist with the migrant campaign group Puente, tells me the effect of the unique Arizona laws that make it possible to be lifted off the street if you cannot prove your status, is chilling. "Kids say to their moms, 'Mom, don't go to the store. Don't leave the house'." Thousands stay at home in fear, she says. But attitudes are polarised. At the West Valley Tea Party Patriots meeting I attend, campaigners for migrants are accused of being "communists". I ask about the imminent debt ceiling crisis and they hand me a dossier claiming to prove President Barack Obama is really Kenyan. I ask about migration. The Patriots are raising money to build a private border fence. Can they understand why the migrants come? Yes, but they believe it will not harm the US economy if the whole 12m-20m estimated to live in the US are deported. You can't jail them all, I venture. "Just build a bigger tent," says Karen Szatkowski, their spokesperson. And there is evidence that the jail conditions, the aggressive policing and the laws that have prompted an economic boycott campaign against Arizona, are working. Anecdotally, around 100,000 migrants have gone elsewhere. "It's designed to make us self-deport," says Fernando Lopez. Tension and conflict around migration here is more intense than anywhere in the US. Meanwhile the economy declines. Arizona is still in recession and the radio sings to adverts for repossessed ranches in the desert. "You can hunt there, ride, anything you want... it's your ranch!" urges the disc jockey, perkily. Here the gas stations are far apart and the Mojave desert is wide, so I have timed my refills rigorously against the distances on the GPS. But the GPS does not agree with the mercury's fuel gauge, so I glide into a truck stop at Cedar Hills in neutral gear, having run eight miles (13km) on empty. The shop is full of stuff that is emblematic - the stimulant drinks in yellow bottles that keep truck drivers going all night, confederate flag-themed headscarves to wear on your Harley instead of a helmet, Route 66 stickers. Like so much of American culture, the subtext - if you dare admit it - is "we were great once". I cross the Mojave by night and get to Bakersfield at midnight. The bar at the hotel is full of oilmen and military guys. The economy of Kern County, where the Joads ended up, is dominated by the Air Force, naval weaponry, big oil and private healthcare. But there is still 15% unemployment here. The town grew by 25% in the past decade but now the property bust is here, 156 homes in every thousand are repossessed. In the morning, the car valet - a Mexican - tells me the agricultural work is drying up. The farmers sold their fields for property. You can only earn the minimum wage. I go in search of the spot where Steinbeck must have seen this - "They drove through Tehachapi in the morning glow, and the sun came up behind them and then suddenly they saw the great valley below them…"
But the interstate highway obliterates the old road here. I drive into a vineyard to get the view that must have greeted the real-life Okies as they crossed the mountains into the San Joaquin Valley. It is still beautiful. But hidden away from the mainstream media you can still find stories of social conflict and poverty that tell the other side of the story. When he wrote the novel in 1939, Steinbeck pointed to a new economic model that would sustain the economic recovery, create jobs and drive the US into the era of prosperity and full employment. That is the question that still confronts the US, as its president and legislature - as the Onion magazine so wryly put it - "continue the debate over whether the country should be economically ruined". Paul Mason's journey can be seen in the UK on Newsnight, Thursday 28 July 2011 at 10.30pm on BBC Two.